Q? Are you Part P registered? A. Yes, DJK Projects is Part P registered, affiliated through NAPIT. A. This stands for Residual Current Device, an electrical wiring device that disconnects a circuit to prevent potentially lethal shocks. They are designed to disconnect quickly enough to prevent injury caused by such shocks. Q? Do I need to upgrade my consumer unit? A. We recommend to all clients that they upgrade their consumer unit to comply with 18th Edition Regs. Q? 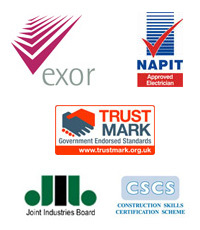 What is an EICR? A. This stands for Electrical Installation Condition Report and has now replaced the former ‘Periodic Inspection Report’. 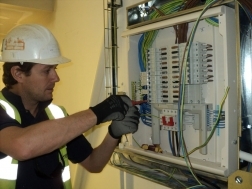 An EICR involves the inspection and testing of any electrical installation before providing a report on the condition of that electrical installation at the time of inspection. Please note it is only a report and not a certificate. Remedial work should be carried out for defects, dangers, and any non-compliance issues highlighted in the EICR. Q? How do I know if I need an electrical re-wire? A. DJK Projects can provide an on-site survey to determine whether your electrical system needs re-wiring. If it is unsafe, it could be a fire hazard and may mean higher bills too. Also, when/if you come to sell your property it could affect the value of your home or office and will be flagged in the building survey. Q? What is 18th Edition? Q? Do you provide free quotes? A. We supply all of our clients with a free site survey and quotation. Q? I have not got planning consent yet, can you provide me with plans? A. Our local, reliable architects can help you draw up plans and apply for planning consent. Q? How much will it cost? A. In order to put together an accurate costing for your project, we would need to arrange for a site visit. Q? How long will it take? A. After our site visit we can put together an outline program of works for your project. Q? Can you provide references? A. We have a number of references in relation to your particular market.